Four Western Law faculty members who specialize in international law, shared their research at the Canadian Council on International Law (CCIL) conference held in Ottawa on November 1-2. 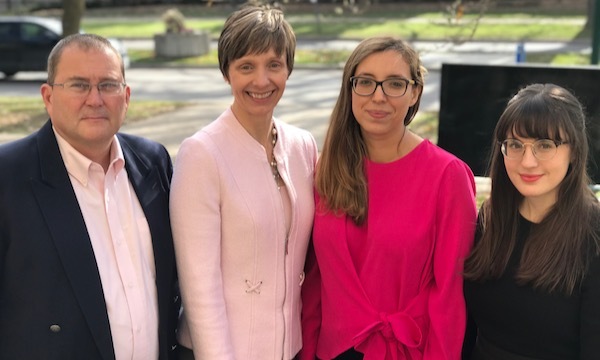 Professors Stephen Pitel, Valerie Oosterveld, Roxana Banu, and Joanna Langille are members of a newly-created research group at Western focusing on Public and Private International Law. The CCIL’s 47th annual conference, “International Law at the Boundaries”, drew major practitioners and scholars of international law from across Canada and beyond, attracting leading speakers including Harold Koh, former Legal Adviser in the State Department under President Obama. Professors Stephen Pitel, Roxana Banu, and Joanna Langille and Western Law PhD student Sophie Stoyan, co-organized the conference’s only panel on private international law, the field of law that governs transnational private law disputes. The panel, entitled “The Utility of Boundaries? Recent Issues and Developments in Private International Law”, featured presentations on recent issues and developments in in the field, and analyzed two important recently decided Supreme Court of Canada cases: Douez v Facebook, Inc.,2017 SCC 33 and Google Inc. v Equustek Solutions Inc.,2017 SCC 34. Pitel considered several challenges raised by the Court’s new approach to taking jurisdiction in civil and commercial cases, particularly for statutory and concurrent claims. Banu discussed her new project on the intellectual history of human rights discourse in the theory of private international law, and Langille outlined her book-length project on a new rule of law approach to understanding the public policy exception in private international law. Stoyan proposed a new approach to taking jurisdiction over companies doing business in a province solely through the internet. Oosterveld spoke on a panel which explored the role of international criminal law and the International Criminal Court in dealing with the alleged crimes perpetrated against the Rohingya by the government of Myanmar. Her talk focused on sexual and gender-based violence directed against the Rohingya and highlighted the international accountability for crimes committed in Myanmar against the Muslim minority group.